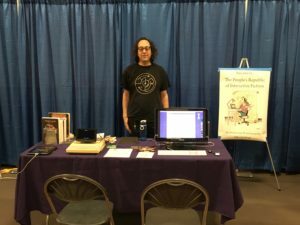 The People's Republic of Interactive Fiction - Boston FIG 2018! There we were for another year of IF outreach. We had Hollywood Hijinx (original 1980s hardware!) and The Wizard Sniffer out. People played both of them. Thanks to Naomi Hinchen for helping at the table, and Nick Montfort for lending the Apple //c.